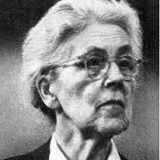 Nadia Boulanger was a believer. She accepted beauty, masterpieces, real classicism. In discipline she searched for creativity and freedom. When I was invited to participate this project I felt honoured. My first thought about this piece was: I should find some audio material. My second was: would ‘Madmoiselle’ have approved that? I have learned from my experience that often the first idea to strike is the best, the most intuitive, the most myself. Since Nadia was known as a pedagogue rather than a composer I decided to focus on her teachings. So I sampled several short statements of hers, then from each of them derived various micro samples which I manipulated on the computer, as if fibres of a sound sheet. Eventually this sheet served as a canvas onto arrange as a collage like Nadia’s quotes. Once after having sketched this abstract portrait I use the piano to unify and colour the outlines, like in the children books. Notes on Nadia is not a piece for piano and samples, it is a piece for Nadia Boulanger.